Findenser requires no running water to operate. Water is a precious resource. It makes little economic or environmental sense to waste thousands of litres just to cool a single condenser. For synthesis with ‘low’ boiling point solvents, Findenser showed a significant improvement in solvent retention. With acetone or DCM the reaction boiled dry when using an air condenser, yet Findenser retained 95% of the solvent under the same conditions. 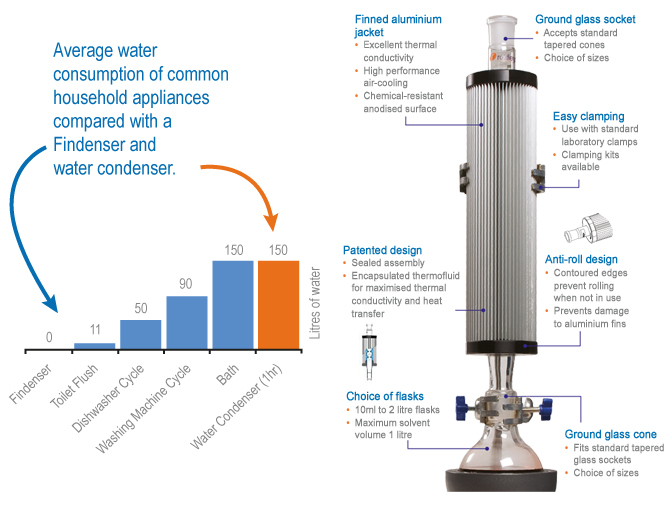 The glass condenser design has a greater internal surface area than traditional condensers, increasing heat transfer capacity. The finned jacket fits around the glass condenser, further increasing the external surface area. The result is a "SUPER air condenser".